A "winter garden" and indoor street appear in designs unveiled for a new leisure centre in Berkshire. 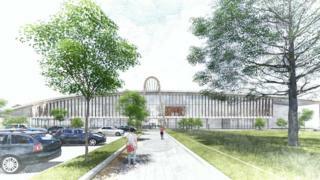 The £32.8m Braywick Park centre in Maidenhead will replace the "ageing" Magnet leisure centre, the Royal Borough of Windsor and Maidenhead said. Other key features include a larger pool and gym, a new soft play area and 500 parking spaces. The final designs will be submitted in October, with an planned opening date at the end of 2019. The new centre will be built in the rural surroundings of Braywick Park sports and recreation ground, which already has facilities including football pitches and a running track. The indoor garden featuring perennial plants was designed to "respond sensitively to the parkland environment", architects Burke Rickhards said. Residents are invited to have their say on the new designs here.